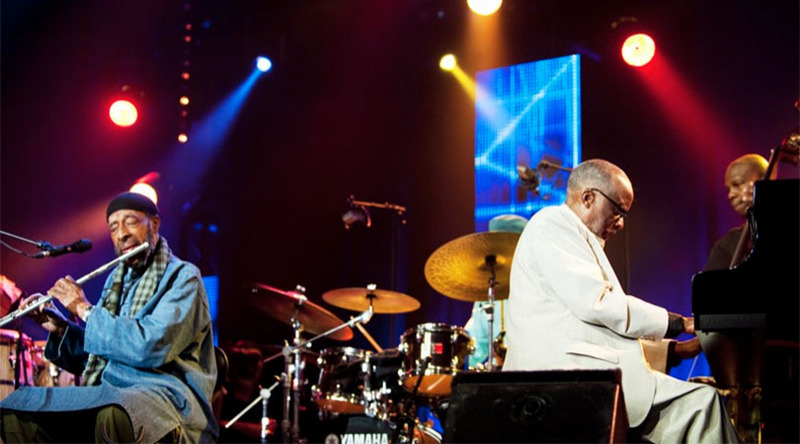 Most musicians get tired and slow down with age, but Ahmad Jamal shows no sign of either. His playing is vigorous; still spry and minimal and best of all his intellect is agile and he is witty, full of ideas and his music is continuously breathtaking. Mr. Jamal has been praised as one of the greatest musical innovators over his exceptionally long career lasting over five decades. Ahmad Jamal entered the world of jazz in the wake of bebop greats Charlie Parker and Dizzy Gillespie who had established a music where speed and virtuosic improvisation were their norm. Mr. Jamal, however, took steps in the direction of a new movement, later coined by the phrase “cool jazz” – in an effort to move jazz in the direction of popular music. He emphasized space and time in his musical compositions and interpretations, something that was diametrically opposed to the blinding speed of bebop. His music drew a group of musicians and helped pave the way for Miles Davis—who came to exemplify the cool style—as well as Herbie Hancock, Bill Evans and McCoy Tyner. In truth Mr. Jamal was second only to Thelonious Monk in innovation and creativity and in his use of time and space in music. This enormous set is practically the next best thing to a small boxed set as it contains a generous helping of music both on CD and on DVD. The music on CD was all recorded on June 27, 2012—one day—that speaks volumes for the youthful energy of the pianist, now over eighty years old. The videos of the songs were recorded at the same time and later edited into this seamlessly beautiful film. If the musicians all draw attention to themselves for their soaring virtuosity the central character remains Ahmad Jamal, who draws not only the musicians but the appreciative audience to himself. Upon reflection it is possible to describe this package as one of the finest of Mr. Jamal’s music made in the decades since he has been performing, hence the belief that the pianist has turned, like a rare vintage, more exquisite with age. It contains over 10 of his recordings; the most popular works of the pianist, each of which is well represented in his catalogue of decades. It is in every one that Ahmad Jamal offers either a benchmark or a version to stand with the very best. To wit, his performances of “The Gypsy” and “Laura” compare with some of Thelonious Monk’s performances of his classic pieces, in the majestic unfolding of themes and the credible dispatch of vaunted arpeggios of the notoriously difficult right hand. His elementally beautiful version of the chart made famous by Sammy Davis Jr. is among the most exquisite on this repertoire—a miracle of poetry, heady bravura and structural command. And then there is the special guest, the 91-year-old Yusef Lateef who takes the stage and if music could get any more grippingly exciting, then that would be in this CD 2 of this set. The presence of Mr. Lateef makes this a near-mythical set. The winds player brings his saxophones, flutes and grisly voice to several charts and his version of “Brother Hold Your Light” is affecting and melancholic. The rippling textures that Mr. Lateef and his array of instruments brings to the music on which he is featured, is utterly exquisite and showcases his greatness on what turns out to be a short feature, but which raises the ante of the concert considerably. Mr. Lateef is extraordinary on “Exatogi” and his other extraordinary composition, “Masara,” both of which draw the percussionist Manolo Badrena into centre stage again. There is no centrepiece of the performance but if one were to be considered for the overall package then that would be the DVD. This is exquisitely photographed and edited, with several cameras and the visuals are stunning. It also brings to life the performances of players not normally noticed when someone as stellar as Ahmad Jamal is performing and that means his bassist, Reginald Veal, drummer Herlin Riley and the celebrated percussionist Manolo Badrena, who are all absolutely brilliant throughout and serve the master well. Track List: CD1: Autumn Rain; Blue Moon; The Gypsy; Invitation; I Remember Italy; Laura; Morning Mist; This is the Life; CD2: Exatogi; Masara; Trouble in Mind; Brother Hold Your Light; Blue Moon; Poinciana; DVD: Autumn Rain; Blue Moon; The Gypsy; Invitation; I Remember Italy; Laura; Morning Mist; This is the Life; Exatogi; Masara; Trouble in Mind; Brother Hold Your Light; Blue Moon; Poinciana. 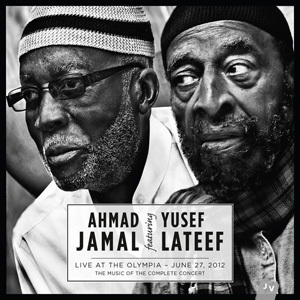 Personnel: Ahmad Jamal: piano; Reginald Veal: double bass; Herlin Riley: drums; Manolo Badrena: percussion; Yusef Lateef: saxophones, flutes, vocals.